Mario Mandzukic often scores important goals and he did so again as he helped Juventus to a 1-0 win over title rival Inter Milan in the Derby d'Italia on Friday. The imposing Croatia striker headed home in the 66th minute after Inter had missed a couple of golden opportunities as Juventus continued its seemingly unstoppable march to an eighth successive Serie A title. "Mario is a great forward. It's no coincidence he was the Bayern's striker when it won the treble," Juventus coach Massimilliano Allegri said, referring to Mandzukic's spell with Bayern Munich from 2012-14. "He's a player who always has an impact." Juventus has an 11-point lead over second-placed Napoli, which hosts lowly Frosinone on Saturday. Third-place Inter is now 14 points behind Juventus. "Inter put us in difficulty in the first half, creating dangerous situations after we lost the ball," Allegri said. "In the second half we were more solid, ordered and compact ... (Paulo) Dybala played better, (Joao) Cancelo had a great game, Mandzukic scored, (Cristiano) Ronaldo worked a lot." Inter must pick itself up for Tuesday's Champions League match against PSV Eindhoven, where it needs to do better than Tottenham does at Barcelona in order to qualify for the knockout stages. "We weren't consistent enough and we made too many mistakes in reading some situations, an aspect in which Juventus never makes mistakes," Inter coach Luciano Spalletti said. "We can never let our concentration slip, because when we did so we conceded." Juventus is already qualified for the last 16 of the Champions League but travels to Switzerland to face Young Boys on Wednesday with the group lead on the line. Dybala had the first chance of the match but headed Ronaldo's cross over the bar after drifting into the penalty area. Inter had two great chances in quick succession. Mauro Icardi did well to hold the ball up and pick out a good run from an unmarked Roberto Gagliardini, but his scuffed finish came off the inside of the right post. Moments later Icardi and Ivan Perisic both went for a Matteo Politano cross and ended up colliding with each other. 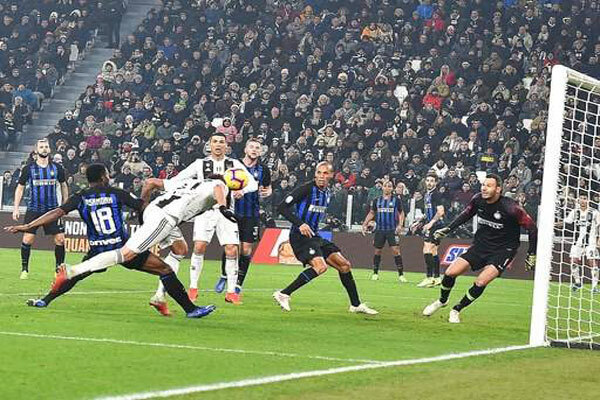 Juventus began to take control and Marcelo Brozovic had to desperately slide in to block Rodrigo Bentancur's effort. Veteran defender Giorgio Chiellini scored his first goal in two years in last week's 3-0 win at Fiorentina and he almost got another one but he headed the resulting corner narrowly over. Juventus finally broke the deadlock when the former Inter midfielder Cancelo put in a delightful cross from the left for Mandzukic - who netted in the World Cup final defeat to France - to nod in at the far post. There was more positive news for Juventus as midfielder Emre Can came on late on for his first appearance for the Bianconeri since Oct. 6, having undergone surgery to have a thyroid nodule removed.